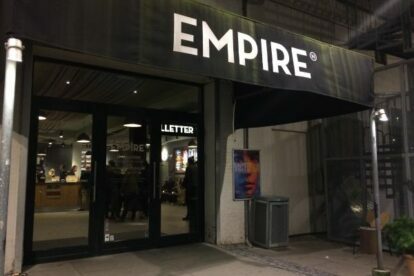 Empire is this little hidden movie theater gem, tucked away in inner Nørrebro. Right now it is in a small alley, where you wouldn’t normally go after hours, but the area is developing fast and restaurants and cafés are popping up everywhere. The theater has the very rare quality of making you feel like you’re stepping into your favorite café or old, little shop. It is rustic and charming on the outside already. Inside there is a café, where you can sit on the way to screening room 4½. Tell me truthfully that that doesn’t remind you of Harry Potter, and that that alone doesn’t want to make you go there?! There are many reasons to go here – it’s one of the only cinemas outside inner Copenhagen. – They serve specialized beer, from microbreweries in a bottle, to take with you inside. – Each seat has 1.2 meters of leg room. But if you actually go to the movies to see the movies, I would still recommend Empire. They screen small, independent films alongside the must-sees and the rooms are tilted enough that you don’t have someone’s head in the middle of your subtitles. All in all, they make room for the narrow films and a different movie experience than the regular Hollywood theater offers – before and during the film. Just next door a specialized brewery and one of the best restaurants in Copenhagen, so you can make a night of it.